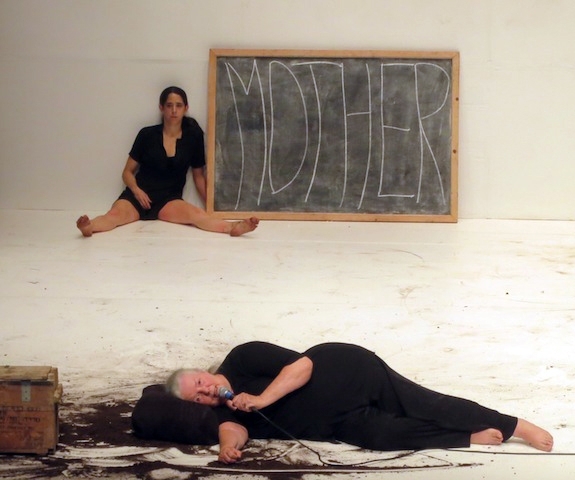 Shut Down is a confluence of the current sexual politics whirling around the #MeToo campaign and Charlotte Vincent’s 30-year concern with gender politics at the heart of her work since she started her company in 1994. It’s Vincent’s first all-male work, and as dancer Robert Clark explains at the beginning as if introducing a BBC documentary on the subject and very much aware that he is also one of the subjects under scrutiny, it’s ‘about men’. Shut Down appears at the Brighton Festival as a film installation at Onca Gallery, but it has also been conceived as a live performance. Bosie Vincent’s stunning visual transformation of the choreography projected on a row of six screens takes advantage of the medium to present the work not only in the context of a stage setting but also transposes sections to the landscape and architecture of East Sussex and Kent. By adjusting our gaze and focus from the particular to the panoramic, from the individual to the ensemble, and from interior to exterior, he adds layers of meaning to the conceptual framework of the choreography. The stage setting will be familiar to those who have seen Vincent’s Motherland, with its black and white costumes on a white floor that extends up the back wall on which words and designs can be scrawled in charcoal as part of a shorthand that links ideas and emotions with choreographic gesture; we can read Vincent’s work as well as see it. In the case of Shut Down, the writing on the back wall of the theatre starts with the word MAN in capital letters — what Clark suggests is ‘the problem’ — and grows in the course of the work into a complex lexicography of descriptive, angry, caustic and mocking words and phrases about the current state of manhood. In her focus on gender inequality, Vincent has not held men in high esteem and has judged them, as in Motherland, in contradistinction to women. 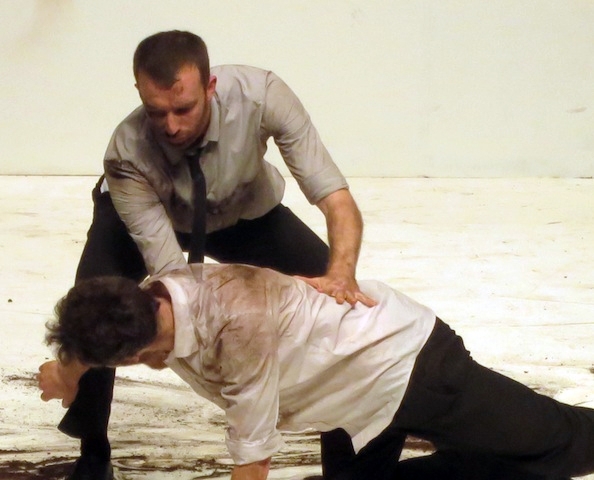 In Shut Down, there is no contradistinction, no emotional or behavioural reference; this is a roast in which men of three generations (Clark, Jake Evans, Janusz Orlik, Jack Sergison, Marcus Faulkner and James Rye) act out their stereotypes of masculinity in the absence of women. Vincent shines a warm light on the young men and they play their role of foils to their elders with a poignant innocence. Evans is a particularly charismatic performer who is allowed the freedom to embrace the fullness of his ‘otherness’. The focus of Vincent’s scorn is on the older generation who are set up as white sexual predators, figures lacking empathy, lost, or all three; she does not let them evolve outside a visual and choreographic image that excoriates them, a generalized construct verging on misandry. Clark and Orlik seem destined to illustrate all that is wrong with men and are all too keen to plead guilty to all offences; they are placed on the firing line and given the rifles. There is no humour in Shut Down that is not caustic or sardonic, no play that is not illustrative of a breakdown in relations. The one who is allowed to escape this sense of failed masculinity is Sergison who is nevertheless balanced precariously between youth and the conflicted trap of manhood. In the final game of hide-and-seek where he is abandoned by the others, his frustration — ‘Guys, you always do this to me’ — is a moment where the imagery gains in power from the words and the words resonate with the imagery. Elsewhere in Shut Down the subject of maleness is too often betrayed by a verbal and conceptual content, underlined by Eben’flo’s raw, castigatory spoken word, that acts like a web in which the older men are hung out to dry. As the three generations dance around a burning fire towards the end in an act of communal resolution the filmed image is superimposed by Vincent’s crackling flames with their traditional connotation of Hell. These men don’t stand a chance. I came away from Fevered Sleep’s Men & Girls Dance at The Place with an empty feeling that had started during the performance; for a theatrical presentation this means a failure. The empty feeling developed into a sense of annoyance, all the more vexing as there was nothing specific I could identify in the show that supported it and it was in marked contrast to the upbeat vibe of an audience who evidently loved it. The common language between men and girls is play, and this is where the production works best. The set is covered in newspaper pages, crumpled up and heaped at the back or carefully taped together in sheets like a quilt in the centre of the floor. Leaving aside the metaphorical significance of media coverage as floor coverage, the games played in this arena draw me into the engagement between the nine girls and the five men (including a brilliant entrance for Robert Clark who emerges from the crumpled newspapers at the back, dressed in…crumpled newspaper) with a theatrical sophistication that stands on its own. 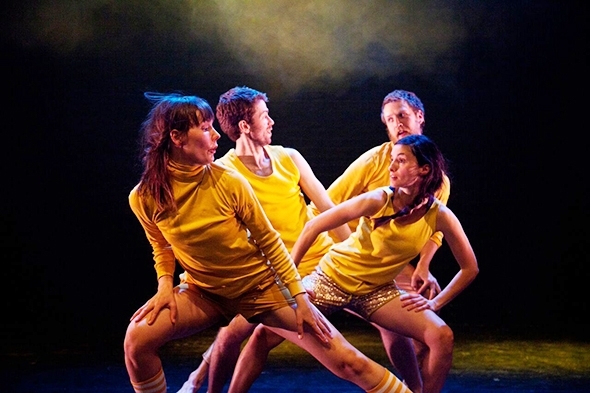 But beyond this delightful play, the choreographic ideas have the drawn-out quality of blandness with a giggly smile. Part of the popularity of Men & Girls Dance undoubtedly has to do with the young girls who are auditioned locally wherever performances take place. In London the girls are Pebbles Doughty-White, Molly Beasley-Martin, Maya Demetriou, Belesther Huberson-Abie, Chadni Miah, Neve Seekings, Momoka Taniguchi-Warren, Amber Worboys Sayers and Rania Yarde. It must be a wonderful and nerve-wracking experience for them: wonderful to be performing with these five men (Clark, Kip Johnson, Luke Crook, Nick Lawson and Matthew Morris) and nerve-wracking to be learning both text and choreography to performance level in a short space of time. They do it brilliantly. 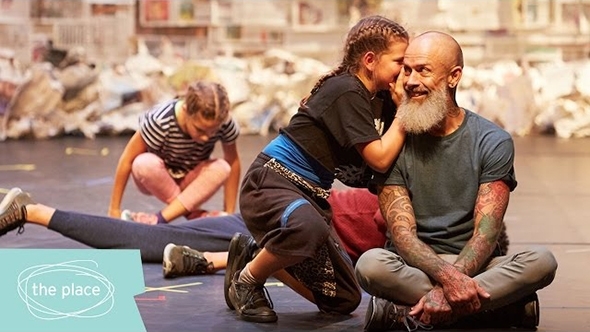 The other draw for Men & Girls Dance is that it’s a project whose premise you can’t easily reject: to create ‘a public space which allows play, tenderness, trust, empathy and love’ between men and girls. One can understand, for example, why the Wellcome Trust would want to support it and how the hype around the show generates ticket sales (the run at The Place has 9 performances, up to and including Saturday April 22). But a theatrical performance is more than its premise, and my empty feeling perhaps has its origin in the distance between the proposal and its manifestation. Men & Girls Dance treats a subject that is both light and dark, but its presentation on stage is only light; so where is the provocation, and to whom might it be addressed? It seems the only troubling thing about Men & Girls Dance is the absence of anything troubling. It’s a show the girls in their intuitively playful way might have choreographed and then asked the adults to formulate emotionally and intellectually. While the parallel social implications may well be contentious — the 64 pages of program text are an indication of how sensitive the subject can be — the choreographic manifestation in a controlled public space where the men need DBS checks to perform loses all pretensions of being provocative. Could it be that an unintended consequence of current written funding applications is that what ticks the right boxes is the social significance and implications of a proposal rather than the quality of the performance which, at the point of application, may not yet have been created? Fevered Sleep has written a carefully worded newspaper about the subject of men and girls to accompany the show, offers discussions on the subject within each community where it plays and has garnered plaudits for broaching the subject — all valid — but it feels as if the company has sold us the funding application rather than the show. There is something about the dancers Carlos Acosta has gathered to celebrate his 40th birthday that reminds me of a band of players that puts on performances for the sheer joy of performing. Although Acosta is clearly the central figure there is a thoughtful egalitarianism in the various performances, an abandonment of star status for the delight of working collectively. In an interview with David Jays, Acosta says that ‘In my programmes, people are not just dancers — they are people who dance.’ It is an apt distinction, for what comes across in Classical Selection is the human element, the drama, the filtering out of any conceit to lay bare the person dancing. Pianist Robert Clark is alone on stage in a pool of light, playing a Tchaikovsky nocturne. A second light picks out an empty chair in which Acosta, dressed in military attire, soon relaxes as if to start a rehearsal of Sir Kenneth MacMillan’s Winter Dreams. He massages his foot, takes off his leggings, stuffs them in a bag, and puts on an overcoat. Any pretense of rehearsal evaporates as Marianela Nuñez arrives. Acosta throws off his coat (so soon after putting it on) and rushes to her. What follows is a duet of leave-taking between Masha and her lover Vershinin based on Chekhov’s Three Sisters. It is rich MacMillan territory in miniature, and the contrast between the exquisite Nuñez and Acosta’s bravado — she speaks in lines and beauty, he in clarity of force — keeps the drama alive in a passionate complexity of lifts and embraces that dissipate with his abrupt departure and her collapsing on the discarded coat. In creating the programme for Classical Selection, Acosta wanted to ‘revisit some of the choreographers who have shaped and inspired me as a dancer down the years and to showcase some of the dancing talents with whom I have had the privilege to work’. Melissa Hamilton dancing Mikhail Fokine’s The Dying Swan is clearly in the latter category, the first of three works in which she dances. Last year Susan Pritchard and Anya Sainsbury produced a book on Anna Pavlova (for whom Fokine created the solo) to mark the centenary of her moving to Ivy House. The old photographs show Pavlova at the height of her artistry but with a balletic line that appears less refined than that of today’s Royal Ballet. Melissa Hamilton has a precision in her wrists and arms that is swan-like but a high arabesque that belongs elsewhere. Unlike the musical interpretation (by Robert Clark on piano and James Potter on cello), Hamilton does not differentiate (as in a swan) the beauty and fragility of the upper body from the working of the legs, so we are drawn to her lines rather than to her heart: she is a swan, but she is not dying. Sir Frederick Ashton’s choreography is so deceptively simple perhaps because his language is so articulate and clear; his steps dance the dancers. In Rhapsody, to Rachmaninoff’s Rhapsody on a Theme of Paganini, Ricardo Cervera and Yuhei Choe are all freshness and light, and Choe is quite fearless as she launches herself into Cervera’s arms. Rhapsody is like a sketch in pencil with watercolour highlights in which the costumes amplify the movement to perfection. As the lights come up on Scheherezade, a story ballet from Diaghilev’s 1910 Paris season, it looks as if two oriental sleeping bags are on stage, a vestige of the exotic design of Leon Bakst’s original sets. The role of Zobeida was originally made for Ida Rubinstein, a beauty of her time whose power was in her mime rather than her dance. Nuñez is a beauty of our time, but she is also an exquisite dancer; she brings almost too much to the role. Acosta has all the animal quality and the overcharged energy of the passionate slave bolting into the harem for a brief, forbidden moment, with his large hands, like a Rodin sculpture, exaggerating his thrall. The extract is all expectation and suggestion: Nuñez is languorously supple and seductive, succumbing inevitably to the passion of Acosta who, after a final, brief climax, is spent. Unlike the murderous ending of Fokine’s full-length ballet, this is a ‘petite mort’. In another kind of bedroom, an opulent four-poster dwarfs the set of MacMillan’s Manon. Nehemiah Kish as Des Grieux is writing at a desk while Leanne Benjamin as his lover makes her sensual way from the sheets to his side, snatching his feather quill and, forgetting it is not a Parker fountain pen, tossing it away with a great deal of force for very little effect. Kish gets up not, it would seem, from any internal motivation but because the choreography dictates. She wants to play but he does not. She has the looks, the sinuous passion; he keeps well within his balletic shell. Their kiss at the end is, finally, believable, but the extract never really gets going, as it takes two and Kish’s motors are not turning over at Benjamin’s rate. He appears stilted: technically able, but without the emotional spark. A musical interlude allows the orchestra, under Paul Murphy, to let rip on one of Dvorak’s Slavonic Dances, directing the audience eastward from France to Russia. Agrippina Vaganova’s choreography, Diana and Acteon, is a demonstration of the classical training for which Vaganova as a teacher is so renowned. And Acosta and Nuñez thrive on it. Nuñez already displays a lovely opening ballon before there is an audible ‘Aaaah!’ from the audience as Acosta flies in. Nuñez and Acosta are very calm together even though the choreography, on a bow-and-arrow theme, is highly charged and virtuosic. Nuñez’s split arabesque penchés are probably not in the original Vaganova conception but do not appear out of place as her entire performance is transposed to a consistently higher plane of performance. Acosta’s solo is beautiful, contained and centred, even if he has to put himself back on to his pirouette. Nuñez is ravishing in her solo with a breathtaking series of opening penchés. They are not all particularly feminine steps, but she brings together her strength and poise to create beautiful shapes. Acosta and Nuñez evidently inspire each other, and the coda is thrilling. There is a lovely moment when he partners her in pirouettes then takes away his hands to leave her to continue turning as if he were never there. This story of Diana and Actaeon has a happy ending: by the time this duet is finished, Diana’s desire for vengeance has metamorphosed into physical union. This is what we have come to see, classical ballet danced by two artists who are at the peak of their art. The second half of the evening is more choreographed than the first, an almost continuous flow of works with the briefest of pauses and no bows. It is a more satisfactory format. In MacMillan’s Mayerling, Acosta pushes his interpretation of Crown Prince Rudolph to the edges of sanity. A three-panel screen at the back of the stage, a table and two chairs suggest Nicholas Georgiadis’s design for the hunting lodge where Rudolf and Mary Vetsera (Benjamin in great form) meet for their suicide pact. Cervera, as Rudolph’s driver Bratfisch, is delightfully at ease as he tries in vain to entertain the couple. Perhaps he senses something is not right and jokes away the quiet before the storm. MacMillan is at his most psychologically inventive, having the nervy Crown Prince move his own legs with his hands like someone controlled by an outside force. He craves the drugs that are evidently on the table. Vetsera has left the room to change and reappears in a light diaphanous gown as Rudolph reaches for the morphine. She circles her chair, he circles his and they meet to dance a tormented, passionate duet that gets rougher until he collapses on her. He draws himself up to the table with difficulty to get his fix. She climbs under his legs and reaches up his thighs. It’s heady stuff, and he is now out of control, throwing her around until he collapses on the floor, exhausted. They take each others’ hands. Rudolph then takes the pistol, goes with Vetsera behind the screen and shoots her. Staggering out, he raises the pistol, looks at it, and pulls the trigger just as Cervera returns. The applause seems out of place, a reminder of another tragedy: it was during a revival of Mayerling in October 1992 that MacMillan died of a heart attack backstage at The Royal Opera House. Kish is the soldier in Gloria (I can’t help remembering the image of Julian Hosking in the role), and Hamilton the sylph, his ideal image. It is a complex relationship, with Kish manipulating her body with care (his partnering is superb) yet at one point he holds her like a gun. It is Macmillan at his most spare, a poem of movement in memory of his father who suffered in the trenches in World War 1. Hamilton is gorgeous here, her line matching the purity of voice in Francis Poulenc’s Gloria in G sung by the Pegasus Choir, and Kish is the perfect counterbalance. Another ballet of leave-taking, MacMillan’s Requiem is his ode to John Cranko, friend and fellow choreographer for whose Stuttgart company MacMillan created Song of the Earth. The music is Gabriel Fauré’s Requiem, with the Pegasus Choir once more in the pit. Chris Davey’s lighting creates an autumnal pattern of leaves in which Benjamin appears in angel mode, moving Acosta back from the abyss of his mourning; his body is finely attuned to the voice as he lies listening close to the ground. Requiem is a quiet, fundamental piece that has elements of stillness, as in Romeo and Juliet, that serve to focus the power of the music. There is something universal here as Acosta seems to search for a sign of outer presence, but it’s already in him. His poignant final shape as he lies down, with his feet raised sideways, is reminiscent of Song of the Earth. MacMillan was evidently inspired by the voice; Benjamin in the Pie Jesu is beautifully wedded to the soprano voice of Moira Johnston, showing the purity and sensitivity of the female form, requiring balance, poise and line. She has them all: a joy to watch. For the Rubies section of George Balanchine’s Jewels, Cervera is joined by Meaghan Grace Hinkis. Though Cervera has danced this before with the Royal Ballet, it is a version that does not exercise the wit of the music and Balanchine’s playful, devoted response, with the result that the dancing and the music are separated like misaligned colours in a print. Unfortunately for Hinkis, for whom this is the only appearance, neither ruby sparkles particularly brightly. With Apollo, in which Balanchine ‘laid the foundations of what was to become neo-classicism,’ we see the clarity and elegance of pure form and Acosta and Nuñez bathe in its light. In this central pas de deux, Apollo plays with Terpsichore with breathtaking sensitivity. It is heartening to see a work of Christopher Wheeldon on the bill. Tryst is a quiet duet that carves space beautifully, as Hamilton does in a simple transition from flexed foot to a pointed one. Her tryst is with Eric Underwood who has the luxuriance and grace to complement Hamilton in shapes that collapse, melt and reform like James MacMillan’s music. Underwood and Hamilton work well together. Left gazing into space on a trumpet passage, they roll together to a kneeling position like two perfectly attuned individuals finding each other. The evening ends with Acosta drawing on his Cuban roots in a sensuous and powerful work by fellow countryman and Rambert dancer, Miguel Altunaga, called appropriately Memoria, to music by Mexican electronica artist Murcof. Acosta appears at first in a conical light as if in a jar, his torso and arms dancing while his heart directs. Altunaga brings out all of Acosta’s abilities here: power, passion, and technical bravado in all directions, showing us a dancer who is more completely himself than at any other point in the evening. There is also a sense that Acosta is doing this for us, giving back with a generosity of spirit that lifts the audience with him. In a symmetrical end to the evening, Robert Clark returns to play – this time Sweet Dreams from Tchaikovsky’s Album for the Young – while Acosta sits back in his chair, puts on some warmer clothes, relaxes, perhaps dreams of his life at 40 in ‘the circle of public solitude’. He puts his bag over his shoulder and walks offstage. Three years ago I happened to meet Acosta on the tube as I was passing through Covent Garden station. We spoke for all of two stops; I just had time to tell him I hadn’t yet seen him dance. He responded with a self-deprecating, warm smile that I had better see him soon as he was becoming a dinosaur. The spill of light from the exit lamps dimly illumines Louise Tanoto’s preparations before the start of the performance (wouldn’t it be wonderful if a performance could start in a true blackout), which takes some of the magic away. This is a finely tuned, concentrated performance that should appear out of the dark with the immediacy and vividness of a dream. Nevertheless, Tanoto soon puts back the magic when Guy Hoare’s lighting works it’s own magic with hers. Magic is not something one associates with imprisonment, but Robert Clark has chosen to take the brutality out of the prison and replace it with heart, imagination and stoicism, suggesting that our interior state of life is enough to transform a place or situation. Even if it is clear the stage at The Place is not a prison, still the sense of poetry and freedom in Tanoto’s sensitive performance has the ability to remove any barrier that may fetter our spirit. A chair stands in the shadows beside a cell of light in which Tanoto lies prone, toes tensed against the floor, a bag over her head. To the eerie sound of a repeated organ phrase and a ticking clock her hand scuttles out from under her, reaching away blindly to the perimeter of the rectangle. Having done the rounds she gets up and bumps into the chair on which she sinks her head in a gesture of silent prayer or exhaustion. The bag on her head looks like it has ears but she slowly removes it, crumples it absent-mindedly and takes another tour round her cell. Three steps long, one step wide, she reacts to the sense of constriction by backing out of the light as if someone is sucking her life through a hole in the back wall. A masked figure in black stands ominously in the shadows like an executioner, then disappears. A recollection, a presentiment? The foreshortening of movements, the contortions of her body to keep within the confines of her cell are powerful reminders of physical repression, contrasted with an inner life that is both comic and surreal. As she sits bent forward on her chair, two fingers poke through her long hair, two imaginary eyes peering at us. Now all her fingers comb through her hair and end in fists, becoming defensive gestures, violent gestures that with a sinuous struggle end with hands held firmly behind her back. As we contemplate her next move, she faces us, turns her hands over, wrists uppermost, brushes back her hair, looking at us dispassionately. Hoares’s lighting alternates her outer form with her inner form, making her in turn both opaque and translucent. The music now takes over – Katyna Ranieri singing Riz Ortolani’s Oh My Love — providing a sentimental short cut to memories of better times and dreams of a bright new day. As the volume of music increases, Tanoto turns like a record, or a dervish, arms extended to her side, faster and faster. She has an ecstatic smile on her face as she spins out of control and gropes for the chair. Back to the ticking clock in her solitary cell. Tears. In Cycles is a solo James Wilton created on a female dancer. It is evidently fungible as he writhes through it effortlessly, twisting and turning his well-developed torso into dynamic shapes and lyrical forms that defy gravity with a playfulness that is breathtaking. The title of the work derives from the idea of reincarnation and while certain of Wilton’s phrases repeat like a musical refrain, there is little else in the work to suggest the cyclical nature of life. If the idea has made its mark on his sensibility, its choreographic development has been hijacked by Wilton’s particular form of movement: for such a spiritual subject, the impression is unremittingly physical. I had a similar reaction to Wilton’s earlier work, Cave, that was inspired by the philosophy of Plato and Jean-Paul Sartre, perceptions of reality and the desire to uncover the truth: more the dialectical territory of Robert Pirsig’s The Art of Motorcycle Maintenance than dance material. It is as if Wilton’s intellectual questioning wanders far beyond the capacity of his choreographic body to respond, or that his choreographic body is in a comfortable groove and he is dressing it up in different intellectual clothes. Either way, the clothes don’t fit. Perhaps I am making too much of a program note, but it is Wilton’s note, not mine and I assume his note is a way of giving himself a direction. He did seem, however, to be attracted to, and to have unconsciously given expression to his choice of music, a couple of songs by Einstürzende Neubauten that have a dark, secular fascination that roots one to the ground. Wilton’s introverted gaze and moments of existential angst seemed clearly attuned to the band’s sound while his rhythmic tapping with his foot or the heel of his hand engaged with the unctuous beat of the songs. Wilton has no lack of physical ability and his mind is evidently searching. Perhaps he simply needs to breathe in some fresh air to discover the true form of his intellectual and spiritual yearnings. Lisa Welham’s torso is illuminated (thanks to Lee Curran) high in the air but her source of elevation is for the moment invisible. She brushes her hair back as if sitting at her boudoir, bends forward, arches to the side and all the way round to the front again, then languidly reaches up with her arms for the full effect of being artificially high. She drops down through the ozone layer to a crouching position, just off the ground, in the miraculous embrace of Aaron Vickers. For the next sixteen minutes Welham never touches the ground, like a circus artist on a human trapeze, circling Vickers, climbing him, straddling him, and cantilevering her body from his iron grip. Vickers is undemonstrative, allowing Welham to do all of this without once complaining; he seems in his quiet way to revel in it. Some of the partnering is stunning, but it is not always pretty; there are some awkward angles and manoeuvres (otherwise described as ‘a daringly intimate glimpse into a secluded world of fragile dependency’), but this is inevitable given what Vickers has to do to keep Welham airborne. To suggest There We Have Been ‘takes its inspiration from the troubled relationships portrayed in Murakami’s bestselling novel, Norwegian Wood’ (this is my day for program notes) may be true but it is irrelevant: the entire focus of the piece — what Roland Barthes might call the ‘punctum’ — is that Vickers keep Welham off the ground. Any emotional involvement is swallowed up by this overriding physical objective. How do you end such an exercise? Cousins cheats. 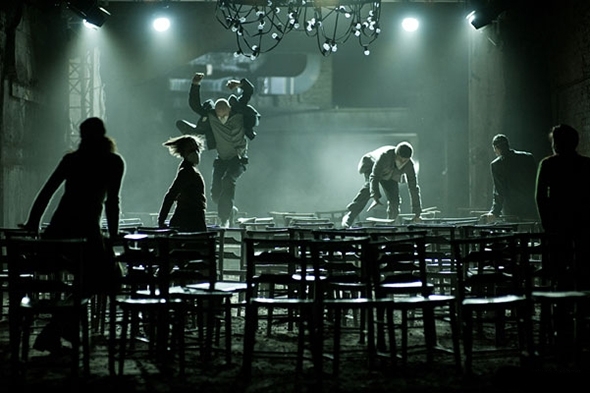 Vickers brings Welham down from the final lift in the dark, where a third person lifts her up again and Curran’s lighting picks her out as in the beginning sequence. Relieved, Vickers walks by himself into a circle of light.